The Wait For Window or Control action allows you to pause a running project until a window or control matching certain criteria has appeared on the screen. • Monitoring a running application in case it pops up an Error or Warning dialog. • Waiting for a process to finish starting up. • Waiting for a process to exit after an operation completes. Use the Target Property Page to select the window or control to wait for. This is easiest if you can automatically configure the action by "showing" it a copy of the object you want to wait for. WARNING: Sometimes, FinalBuilder will automatically configure a window to have a simple description such as "ModalDialog" or "MainWindow". These descriptions can be quite ambiguous. It is suggested that you configure the action to wait for a specific button or other control inside the target window, or that you reconfigure the action to match on the window class and/or caption. "Fail if process not running"
If this option is selected and the target process is not running when the action is started, then the action will fail straight away. 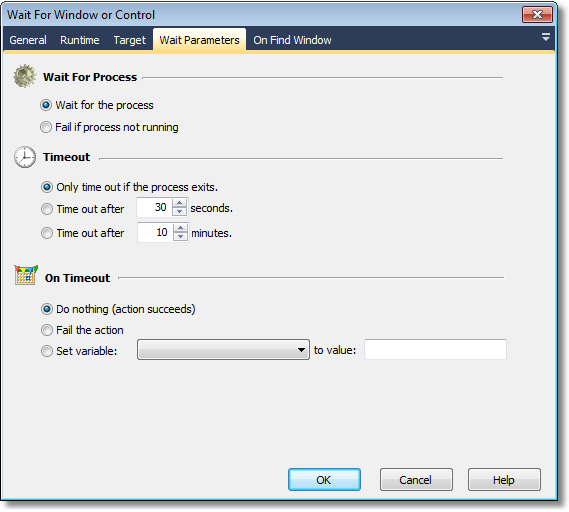 "Only time out if the process exits"
This option disables timeouts for the Wait action, except for when the target process exits. "Time out after x seconds/minutes"
If this option is selected, the action will time out and succeed. If this option is selected, then the action will fail if it times out. If this option is selected, then the specified variable will be set to the specified value if the action times out. If the action does not time out, the variable will not be changed. This property page allows you to choose what to do if the window or control is found. The action will succeed without doing anything to the window/control. The action will close the window which contains the target control (or the window itself, if the target is a window.) This is the equivalent of clicking on the "Close" box of the relevant window. 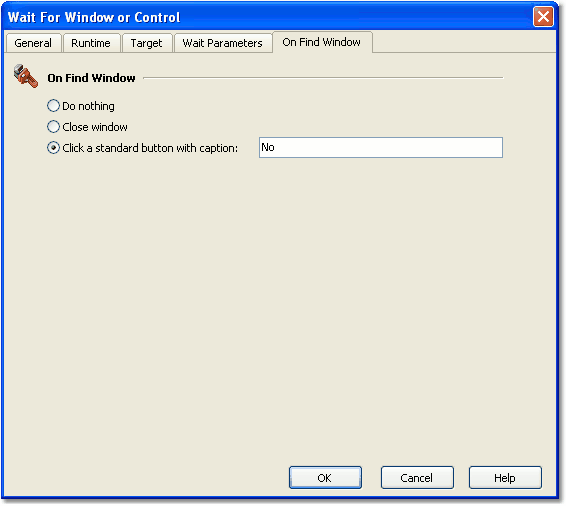 If the target control is a window or a modal dialog which contains "standard" Windows buttons, then this option will click on the button with the specified name. This is useful for modal warning or error dialogs which may need to be automatically dismissed. Hint: If you need to perform more sophisticated clicking, add a Perform Mouse Click action to the project and place it as a child/sibling of the Wait action.